By the end of the nineteen seventies, Japanese cassette deck manufacturers had all but wiped out their European competition, and Nakamichi had established itself as king. But it didn’t stop some much larger companies trying to steal its crown. Indeed, we saw some very impressive machinery from the likes of Aiwa, Akai, JVC, Pioneer, Technics and even Hitachi. Still, the real rival was Sony – which threw vast amounts of its corporate muscle at the problem of making the ultimate Compact Cassette recorder. The problem was that Nakamichi made its own heads, which were dramatically better than most rivals, and accounted for much of the performance advantage. By the late seventies, companies such as Pioneer, Victor (JVC) and Akai had come up with stunning direct drive transports, but still couldn’t touch Nakamichi on heads. It was the advent of metal tape that finally gave them the fillip they needed – here was a formulation that could routinely take high levels at very high bias, and could at last give the frequency response and dynamic range numbers that Nakamichi had been getting for years with standard Chrome. 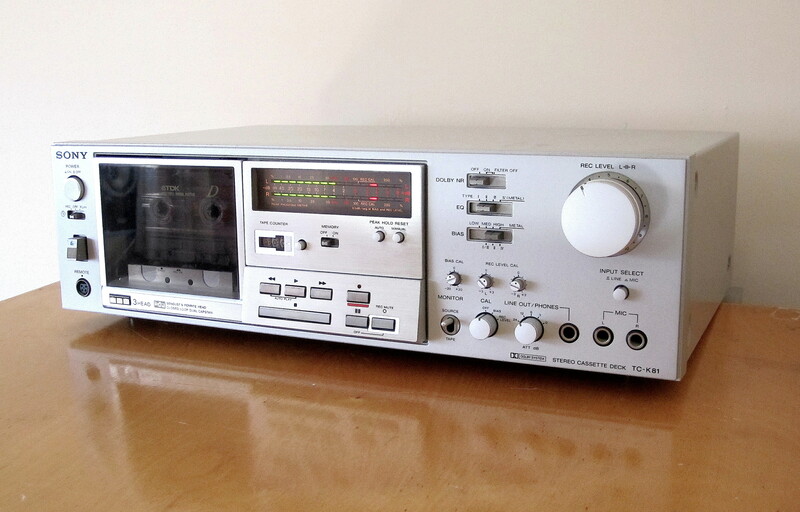 Sony’s TCK-81 was its first shot at Nakamichi’s bows. It had made some seriously tasty stuff before, but here was something that could achieve the magical quoted 20Hz-20kHz using Sony METALLIC (Type IV) tape at last! The company pulled all the stops out, and created something that by the standards of the day in 1981 was exceptional. Funnily enough, it actually lacked some of the trick transport bits that, say, Pioneer’s rival CTF-1250 boasted. There was no multiple quartz phase loop locked direct drive motor array – instead it was a finely aligned brushless, slotless, linear affair driving the capstan via belts working with just one other. The heads weren’t stunning either. Sony had repeatedly used Ferrite & Ferrite heads in the seventies, which didn’t wear out overnight (unlike Pioneer’s Permalloy, for example), but lacked the latter’s fine high frequency response. The TCK-81 got Sony’s new Sendust & Ferrite record and playback, which lent it an extra few kHz up top, but it still wasn’t quite state of the art. The brilliance of the TCK-81 was its clever implementation of relatively modest technology allied to some excellent real world facilities. Its backlit LED meters with switchable peak hold were the best around. The calibration mode was the easiest to use, and one of the most effective. There were no silly track search facilities. It was simple, clean and purposeful inside and out, and well built and aligned. The result was excellent sound. Back in 1981, only a mid-price (or better) Nakamichi could offer such warm, open and natural sonics. Very stable (perhaps not the very best in the business, though), wonderfully smooth and effortlessly musical, the TCK-81 was a joy to listen to. Feed it a TDK D and you’d get a more extended treble than you’d have thought possible, give it AD and you could hit +6dB on peaks with ease. TDK SA was smooth and crisp like few others, and Sony’s late, lamented Fe-Cr (FerriChrome) formulation had a treble sweetness than no Philips Chrome could match. Then, when you were really serious, it was time to slide the BIAS and EQ switches to Type IV and bring on the metal. TDK MA or Sony METALLIC formulations were blinding – brilliantly fast and incisive, with seemingly endless dynamics. Here was a Nakamichi rival for two thirds of the price, that equalled them sonically, and ran rings around them in terms of ease of use and – some would say – style. It cost £300 – more money than a Linn LP12 back then, but many thought it superb value all the same. The good news is that they’re virtually forgotten now – if you can find a good, well looked after example, you’ll not pay more than £100. All that you wrote is the soul of the TC-K81. I have one fully operating since 1981. The other plus was its wired remote commander, the very clear, fast and precise leds, the ultra smooth recording level knob, and as you said, the extremly simple bias & rec level cal procedure. The TC-K81 was not only a joy to listen to, but a joy to record with it, either from radio, vinyl records, live shows, even cd. Thanks for the time you spent to show this noble and timeless comrade. Best regards from Chile, and sorry for my bad english. Thanks Eduardo, and well done for keeping Compact Cassette alive in Chile!